Brown Act Work-Arounds; hide the truth from taxpayers, raise the cost of living in San Diego, increase driving miles, increase greenhouse gases, benefit big money and put all of us at elevated risk. I have published numerous articles on this topic and if elected to council I will endeavor to make government more transparent. Following article was published in the Clairemont Times and Times of San Diego. These days most of the City of San Diego community meetings are not in auditoriums but in small rooms with easels and posters that are manned by Engineers and Consultants. Project Managers like this format for several reasons; 1) Managers only have to set up presentation materials for issues they wish to discuss. 2) Issues that are controversial can be left out. 3) A citizen can still ask an important controversial question but it will only be shared with a few listeners not an audience. 4) Managers have told me they prefer this poster station format since it is less hostile. Which translates into: “We do not want to address controversial issues and this is our way around the Brown Act”. As a result of this we find out years later what project managers left out. By then it is usually too late to change. A good example was the Blue Line Trolley poster presentation in the spring of 2016. The room was small, hot, overcrowded and loud. SANDAG addressed the crowd with a bullhorn. There were no boards/posters for the areas I wanted to ask about, so no discussion was possible. Another way information is hidden from citizens is when lobbyists sue or threaten to sue their own ally. Here both parties can enter into confidential discussions that are protected by instruments like; legally binding non-disclosure agreements. With the Regents Road Bridge lobbyists help corporations identify citizens who are willing to put mall profits above public safety, offering them money and or political office. City government is currently set up to benefit the party with money. For example: currently there are two well-funded parties in the vacation rental dispute. They are an even match since each can raise several hundred thousand dollars to get the required ballot signatures. So San Diego democracy gives both of these parties a voice. Not building the bridge puts the City in a position similar to car companies in the 1970's. Back then car manufacturers could not concede that seat belts saved lives, without putting themselves in a poor legal position, so they refused to put seat belts in cars, putting all of us at risk. Another observation of San Diego’s overbearing is its threat to public safety officials. The Fire Chief provided extensive testimony in 2006 to build the Regents Road Bridge and council affirmed it. In 2016 under threat of; career, pension, and or income loss the Fire Chief did not testify at the 2016 City Council hearing. Big money hires lobbyists who fund politicians who instruct public officials. Going forward the Fire Chief and other public safety officials will need clearance from big money before testifying. Their voice is no longer independent. All these Brown Act work-arounds; hide the truth from taxpayers, raise the cost of living in San Diego, increase driving miles, increase greenhouse gases, benefit big money and put all of us at elevated risk. In 2006 San Diego City Council affirmed that the bridge should be built but the malls chief lobbying firm, The Friends of Rose Canyon (FORC) successfully sued the city to delay the bridge. Things heated up again when in 2008 the University Community Planning Group (UCPG) voted against an expansion of the Westfield Mall. 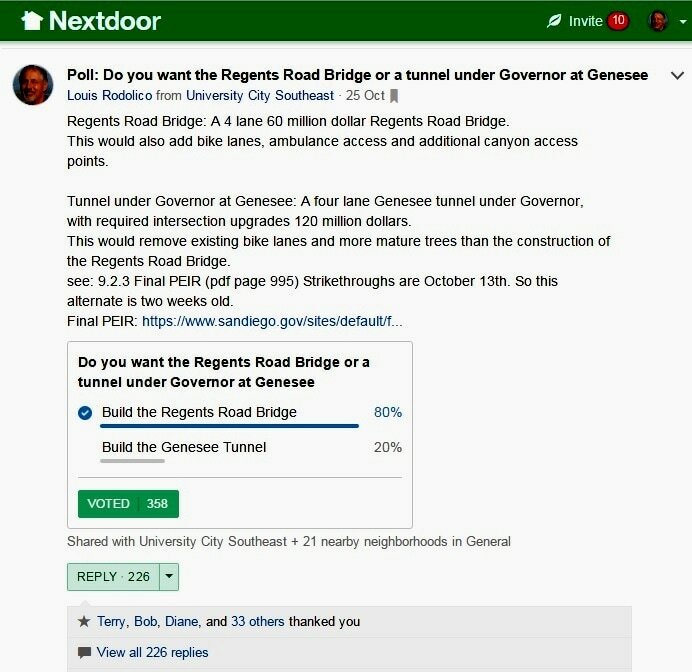 In 2008 UCPG wanted the Regents Road Bridge. Leveraging its construction dollars with the city, Westfield engaged a legion of lobbyists who harvested the community argument over the Regents Road Bridge. They continued their whisper campaign and identified NIMBY’s on the Regents Road Corridor whose property value would increase if the bridge were not built and with city support; fixed elections and created their own customized UCPG “voice of the community” that could be trusted not to raise the public safety alarm. This new UCPG hid important community issues with undocumented sub-committee meetings. FORC threatened to sue the mall, but this was a methodology to keep meetings out of public view. Two thirds of the community wants the bridge built, but lobbyists have restricted all of them from being on the UCPG “Community” board. ​ In 2008 council candidate Lightner, withheld her anti-bridge bias until after the election. In 2008 Westfield Mall entered into a secret agreement with the Friends Of Rose Canyon (FORC). These secret agreements affect our tax dollars. The FORC director was well compensated. In 2014 Westfield Mall paid the half million dollars, for the EIR, to get the bridge off the plan. This customized EIR ignores public safety issues and city officials went along, in a blatant violation of their oath of office. Everything had been teed up for the December 2016 hearing on the bridge. Lightner withheld ambulance mortality data from the hearing and put a muzzle on public safety officials, unlike the 2006 bridge hearing where public safety officials willingly testified and council voted to build the bridge. At the December 2016 hearing there was no roll call to verify speaker’s slips. The venue Lightner chose was council chambers, not Golden Hall, so council could be duped about the numbers of persons in the audience who wanted the bridge. The new UCPG, with all members handpicked by mall lobbyists, falsely represented the “will of the people” as no bridge. School Supervisor John Evans falsely represented that the school district did not want the bridge while failing to note that his house would go up in value if the bridge were not built. When it was all said and done council voted the bridge down. Why should City Council care if these NIMBY’s don’t want this bridge? Council members knew that monies for the bridge could now go to their district and or their pensions. UCPG and NIMBY’s were vindicated and they were the righteous ones. Truth be told, they were bought off for betraying the rest of their community. As payment Southwest UC received; private enclaves, the Fast Response Squad and complete underground wiring. The cities underclass in Southeast UC got stuck with; overhead wires, the high pressure underground sewage lines and excessive traffic delivering poor ambulance service times. South UC is a peninsula with 2 of its 3 main roads incomplete. 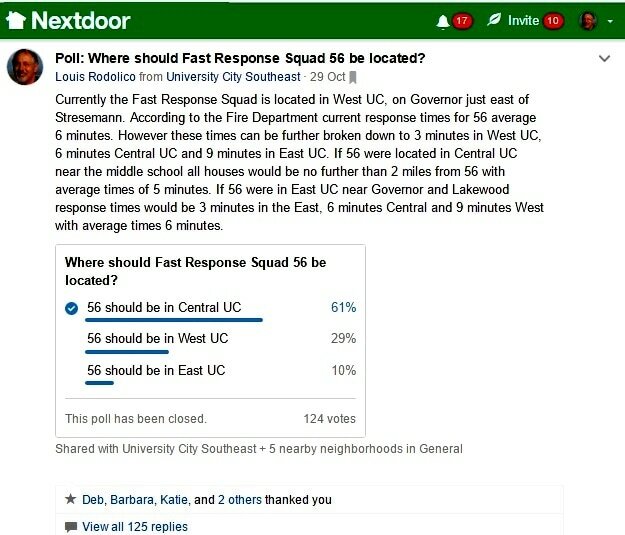 Thanks to lobbyists and undocumented UCPG fire station subcommittee meetings, there will soon be three fires stations in North UC (UTC) and none in South UC, see map. Recognizing this disparity, float units can be preposition-ed throughout South UC. For the foreseeable future University will be controlled by lobbyists loyal to a secretive corporate cabal, rubber stamped by a customized, entrenched UCPG. The bridge and anti-bridge groups will continue to hate each other, providing a distraction. Our tax dollars are directed, quietly, in board rooms. The city will continue to favor the western private enclaves and West UC will reciprocate with UCPG voting as directed by the city. Everyone else will find out about projects when it is too late to have input. 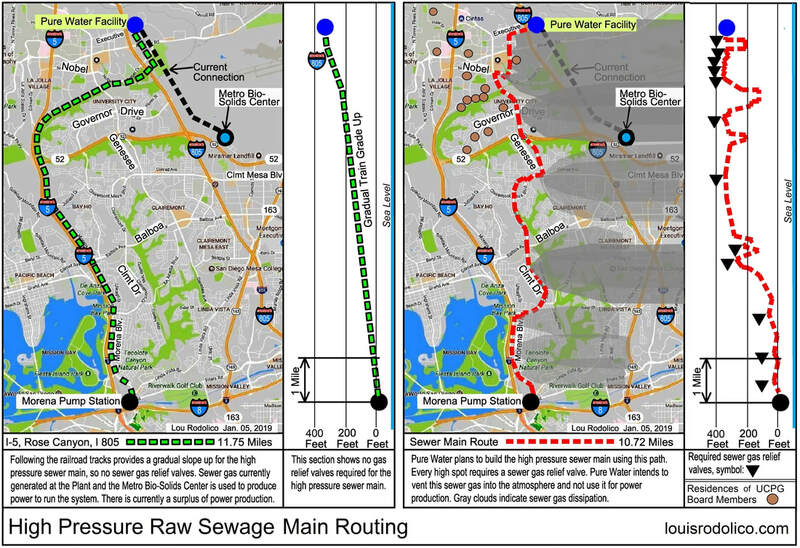 For example; we recently got details on the Clairemont Drive - Genesee Avenue high pressure sewage lines when the construction documents were at 60% completion. Canyon groups, SANDAG and CALTRANS got an early heads up on the project and were given right of refusal, voters were left out. Voters want the SDGE alignment but San Diego consistently rejects community input. See Clairemont Times December 2017 page 11. This is not just a local lobbyist phenomenon. Congress routinely ignores the electorate when it comes to issues like: gun registrations, balanced budgets, health care and tax equity pushing more citizens into poverty. Hate continues to sprout in new places as corporate greed drives its roots deeper into our culture. Will we find the courage to reverse this trend? ​ City Council and CEQA rulings delivered one big winner: Westfield Corporation opened its new UTC expansion late last year, and then promptly announced its sale to Unibail-Rodamco for 16 billion. Westfield Mall will soon be; comfortably nestled between two Fire Stations, have a new bus/trolley terminal and all traffic/customers funneled up Genesee. Westfield re-designed our planned community to improve their property value. With a tip of its hat, Westfield leaves with this message; thanks suckers. Recently it was announced that Westfield is being sold to Unibail-Rodamco for 15.7 billion dollars. Westfield reorganized in 2014 which is the same year they paid a half million dollars to finance the EIR to remove the bridge. In 2008 The Friends of Rose Canyon (FORC) threatened Westfield with a lawsuit and ended up entering into a secret agreement with Westfield. See Link. These are publicly funded projects, what gives FORC the right to threaten lawsuits anyway? How many times has FORC entered into secret agreements, with whom and how were they compensated? FORC whipped the vote for Westfield and helped find citizens who would; profit if the bridge were not built, were willing to sit on the local planning group and be trusted to remain silent about public safety issues. The Cities rulings also helped load the planning group so the bridge funds could be used to finance the cities 2.5 billion dollar pension debt. Since the financing of their pensions were on the line city managers were not acting as disinterested third parties when they set public safety aside. Two thirds of the community wants the bridge built but the city found ways to eliminate all of them from the 22 member planning group. CFTRRB has been given a setback. The CEQA Judge ruled that; "The petition for writ of mandate, filed by petitioner Citizens for the Regents Road Bridge, Inc. ("Citizens"), is denied.​ In short the Judge will not stop the bridge from being removed from the community plan. CFTRRB must determine if they wish to appeal the ruling.